38 Lukie Points will be rewarded to you when you buy this. 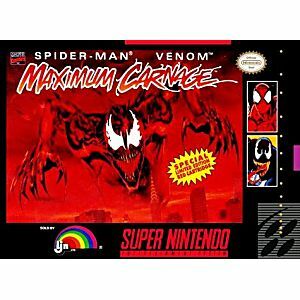 Spider-man / Venom Maximum Carnage SNES Super Nintendo Game Cartridge Cleaned Tested and Guaranteed to Work! Only one maniacal madman can force Spider-Man to unite with his sinister, arch-nemesis Venom: CARNAGE! His deadly rampage is tearing New York City apart! 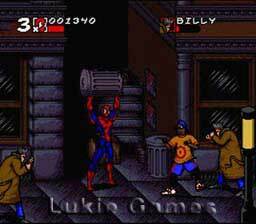 Only wild web-slinging maneuvers, crushing combat moves and Super Hero allies can save the city from total obliteration! 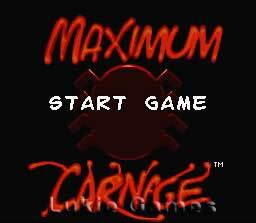 It's maximum mayhem! 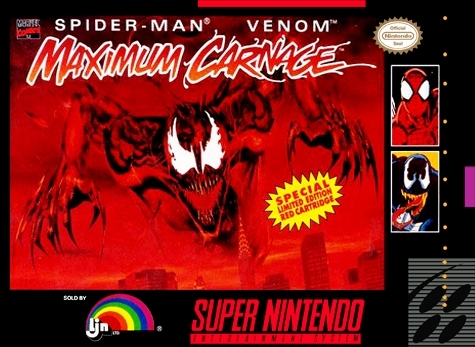 It's Maximum Carnage! Paint the town red! Ljn only had one job,And it was a home run. Get this game?? I absolutely loved this game as a child, and now cannot for the life of me understand why! I must have been a better gamer as a child. I remember having difficulty progressing in this game as a child, but now I just can't even progress. That being said, I love this game. It's hard, very hard.... but progressing is just so satisfying. The animation is great, as is the story. And that red cartridge looks great on my shelf. How about this: the card is red and it,s stands out too because it,s my favourite 1 player game. THE BEST! I like this game alot and its really challenging. Got it quick and in good condition.